My latest column for ESPN looks at the delay to the start of the Indonesia Super League. Check it out at ESPNFC! Indonesian football is pissed. The PSSI is pissed. FIFA is pissed. The fans are pissed. Everyone it seems is pissed at the decision by the sports minister to unilaterally halt the Indonesia Super League season just 48 hours before it was due to begin. Persib had been scheduled to host Persipura last night in the opening game and the visitors were already ensconced in their Bandung hotel when the announcement came through. They checked out Friday morning, returned to their hotel in Jakarta and used its grounds for a training session. Sunday sees them head to Singapore for AFC Cup tie Warriors. Some outfit called BOPI, the Council of Professional Sports, have done nothing for two years...check out their website. Yet now here they are calling on the league to be suspended and the government accepts their recommendation. Apparently some clubs don't fulfill the criteria to compete in the league. Get away! It has ever been thus, why get on the high horse now? Could it be related to PSSI committee elections in a few months time? Who knows but delaying a league so close to its start does seem an odd way of courting popularity. The irony is for the first time ever two clubs, Persik and Persiwa, were prevented from joining the ISL because they fell short of meeting the league's criteria. Why those two were picked on and not others who have more deep seated issues is not clear but it was a rare sign of the PSSI getting tough. One of the conditions not being met of course relates to players not being paid on time, an time old issue here. Of course the chances of clubs honouring their commitments have become even more remote as BOPI delays the league, forcing clubs to scramble round looking for money as gate receipts dry up. FIFA fired off an angry letter asking PSSI to get this mess sorted out as soon as possible. FIFA turns its back on many ills in the game but once it feels its power is being usurped, for whatever reason, they get pissed quickly. BOPI has given the errant clubs two weeks to get their affairs in order. If everything is tickety boo then football can start. If not? Who knows. The PSSI are pessimistic a new schedule can be drawn up in such a short time frame citing international commitments and all the while the delays will be costing the clubs money and potential sponsors. At a time when some clubs are starting to get their house in order this comes as a kick in the teeth to them and all the work they have done. Not for the first time in recent years Indonesia faces action from the game's governing body. With the country set to host a couple of age group competitions as well as compete in the SEA Games in Singapore, any suspension could hit the country hard. In the meantime the AFC Cup goes on with Persib hosting New Radiant next week in Bandung! The SLeague season begins in 1st March with Warriors taking on Balestier Khalsa and DPMM hosting Harimau Muda. The Indonesia Super League has been postponed until 4 March at the earliest. Sriwijaya seem to think joining the SLeague is an option. They are quite rightly put out the ISL has been ut back and the club from South Sumatra have been making noises about moving to join the SLeague. Quite how far these noises have travelled is not clear; there appears to be nothing reported in Singapore thus far. Apparently Sriwijaya have been studying the rules of the SLeague but have they discussed the idea with the league itself? It was only last year Singapore decided they could only support 10 teams and three of them are already foreign. Would they be willing to allow another foreign team to join after the season begins? It all seems very unlikely but until now I have seen no quotes from Singapore...I could ask them in Twitter but they are not that active in that particular arena, especially when it comes to engaging with other people (the actual social part of social media). So you wonder what it is all about. As far as threats go it is pretty toothless. The ISL gets stopped, one team threatens to join a league already underway, it doesn't look like something to bring about any change does it? Coach Benny Dollo doesn't seem to perturbed by the possibility of playing in the SLeague. He has given the players some extra holiday! 2015 is the year Singapore hosts the SEA Games but the football team hasn't had the best of preparations following two heavy defeats in home friendlies. First up was Japan U22s, this mixed age group thing does get confusing, and Singapore U23s lost 8-1. Instead of bouncing back against Syria U23s Singapore U22s ended up on the end of another drubbing, this time 6-1. Syria had arrived in Singapore after a couple of games in Indonesia where they had drawn one (1-1) and won the other (3-0). Singapore footballers mostly have it pretty easy. Playing in Malaysia is considered a culture shock and a tiresome journey can be from Woodlands to Bedok. And while coaches Richard Bok and Adie Iskander will not be too pleased with the defeats they will be using the opportunity to see how the players react. Do they have the mental strength necessary to turn them from good players into winners? Fact is, by playing Malaysia U23 and Indonesia U23 ad infinitum just confirms what we all know; the players are good...by ASEAN standards. But if Singapore wants to kick on in events like the AFC Asian Cup, the Asian Games and even the World Cup they need to raise the bar both on the field and mentally. Singapore U23s and U22s need more games like these, not less. And they need the fans to understand the growing pains are a necessary part of a player's evolution. Ok, I don't really bother with Thai football these days but I do like the idea of Nakhorn Ratchasima in the top flight. And now they have gone and signed Dominic Adiyiah subject to a medical. So what I hear you cry? Well, Adiyiah spent last season playing for FK Atyrau in the Kazakhstan Premier League and I saw him play a couple of times. It is certainly going to be a bit different, the western most steppes of an inland republic to a tropical kingdom in South East Asia. I would like to say I made a note of the player while I was watching FK Atyrau but I can not lie...I was too busy trying to keep warm. The last few seasons haven't been easy for fans of Persita. Kicked out of their home town of Tangerang by a religious edict that banned football at the Benteng Stadium following years of disturbances between rival fans and local residents, Persita have gone nomad, playing games in Kuningan and Karawang...neither particularly convenient for the club's supporters. Next season at least, which should begin next month, will Persita make the relatively short trip to Maulana Yusuf Stadium in Serang which they will share with Perserang. 2015 promises to be a fun campaign in the province of Banten with Cilegon United, Persita and Perserang all competing in Divisi Utama as are Villa 2000 who are based in the province. There is talk of a new stadium for Persita but who knows when, who knows where. Not much has been heard of Persitara in recent months. Jakarta's other team, they are ignored by the media who are attracted by stories, any stories, about Persija. The news the city government are willing to take a stake in Persija has Persitara even more riled. Everyone knows Persija have money problems...despite having one of the largest supports in the country they struggle to pay wages or attract sponsors. Instead of the management doing the decent thing, the club now have the taxpayer taking an interest...and Persitara ain't happy. 'If Persija (with all their resources) can't attract cash then what about us, he continued somewhat whistfully. And there in lies the crux. Why should the Jakarta taxpayer contribute to the running of any football at all? The roads are a mess, flooding is an annual event, doesn't the government have better things to spend its money on than a football club which has a reputation for financial mismanagement? If Persija can't find money then the management should change or they should go the way of other wasteful businesses. Or if you are going to help one then you should help all. Not everyone in Jakarta supports Persija! There had been some talk that Persebaya would be playing their home games in the 2015 Indonesia Super League at Bangkalan Stadium in Bangkalan, Madura. It seems that talk has ended with no less a personage than the mayor of Indonesia's second largest city getting involved. Tri Rishmaharini has not only quashed the move talk, she has said she will intercede with the management of Bung Tomo Stadium, used by Persebaya last season, to lower the rental costs before adding 'I (care) about the future of Persebaya not just because of you (the fans) but because I am the mother of Bonek'. Persebaya are one of the biggest clubs in the country but recent seasons have seen the fans desert them, a conflict that has its roots in the disastrous split that afllicted Indonesian football back in 2011. The club has failed to reconcile itself with its supporters leaving an expensively assembled team last season playing in front of ridiculously small crowds in a large arena. Whether the mayor's move will be a step on the road to reconciliation or will just be seen as a political move ahead of an election remains to be seen. The mayoral move is the last example of political involvement in Indonesian football, normally a move seen as abhorrent by FIFA. Jakarta's government recently announced it was interested in taking over a shareholding in Persija in a bit to help the club stabilise its finances. Certainly some lopsided attendances in the Premier League. KL by the way hosted PKNS at a field in Shah Alam, they are still waiting to return to Merdeka Stadium. Ex Bolton striker El Hadj Diouf made it two in two for Sabah as they narrowly overcame DRB Hicom and Penangs Indonesia/Brazil connection was not enough to secure the points against T Team...Hilton Moreira, ex Deltras, Persib etc, was yellow carded for his efforts! JDT slipped to their first MSL defeat of the season going down to newly promoted PDRM. Even the arrival of Safee Sali on 80 minutes wasnt enough to lift the champions tired spirits...while the other teams in the league have played just two league, JDT have been competing in Asian club football, defeating Bengalaru 2-1 before travelling to Thailand and going down against Bangkok Glass. Time To Wrest AFC Cup From Kuwaiti Clubs? The losses by Persib, Warriors and Johor Darul Ta'zim in the AFC Champions League qualifying rounds won't have come as a big surprise but it does mean South East Asia will have some pretty strong competitors in the AFC Cup but whether one can make it all the way to the final remains to be seen. As is often the case away form will be key with some clubs perhaps better set up to get something on their travels than others. I am not going down the old group of death nonsense but I do think Pahang and Persib should be thinking they have enough strength to make it through to the next stage. Persipura reached the semis last year before mysteriously caving in the second leg of the semi final, losing 6-0 at home to ultimate champions Al Qadsia from Kuwait. In fact Kuwaiti sides have won the last three titles and no side from East Asia has reached the final. I have my doubts that some clubs from our region take the tournament seriously; not out of a lack of respect but domestic campaigns can be draining on resources and you can't blame them for perhaps prioritising games closer to home. We are not really surprised, are we? Perhaps the final score but never the victor. Persib travelled to Vietnam and most of the media stories surrounded the weather; no one it seemed had done their research on their hosts. In fact, Persib, despite winning the ISL last season under Djajang Nurjaman, were forced to find a different coach because the AFC insisted only A licensed coaches could lead teams in their competition. The Indonesian champions turned to Emral Abus. Nope, never heard of him either but he was fully qualified so everyone, well the AFC, was happy. The VLeague has been in progress for a few weeks now so the hosts were obviously going to be much fitter and better prepared than Persib who were coming off the back of a number of friendlies against regional powerhouses PS Padang and Felda United. Mind you, the Thai Premier League has yet to begin either yet both Bangkok Glass and Chonburi were able to record comfortable home wins against Hong Kong and Malaysian opposition. How important is playing at home in these types of games? SINGAPORE - As the S.League moves into its 20th season, a local club have made a bold and unprecedented move. At Hougang United's (HGFC) pre-season press conference at the Japanese Association yesterday, Cheetahs chairman Bill Ng told The New Paper that his club will embrace "financial freedom" for the upcoming S.League season, which starts next month. While the club will continue to collect the annual Football Association of Singapore subsidy of around $500,000, they will donate at least the same amount back to FAS for its football development fund, especially towards youth football. It is understood that Hougang made a profit of $450,000 last season and they aim to continue to be self-sufficient via Ng's contribution, as well as that of other sponsors. MERGER Following their merger with Woodlands Wellington after the end of last season, Hougang could also draw on the proceeds from the jackpot machines in two clubhouses. Candidly, Ng said: "The merging of Woodlands Wellington FC and Hougang United brings about a consolidation of strengths and resources. We want to do more in terms of donations and community work. "The newly formed committee is ready to face the challenges of the digital era. "Responsible budgeting has helped us achieve more financial freedom to choose what we want to do now." With a healthy balance sheet, Ng did not dismiss the possibility of signing a marquee player, but said: "We don't buy trophies, we build for one." Hougang vice-chairman Jeffery Sim then introduced the HGFC Scholarship, which will offer students below 18 and footballers over 21, opportunities to train abroad. The HGFC Challenge Cup, scheduled for the S.League break in June and July, will serve as a platform to scout for deserving candidates. The club also unveiled a $100,000 sponsorship deal by ESW Manage, as well as a partnership with Global Football Academy that has helped the club secure the services of three Japanese players - Under-19 international defender Yuki Uchiyama, midfielder Shunsuke Nakatake and forward Takahashi Manato. The Rams' rich tradition will also not be lost with the merger. Ng handed over a cheque of $12,000 to former national and Woodlands winger S Anthonysamy, who is paralysed from the neck down after a freak injury in a friendly against Selangor in 1996, and added that the Rams' crest will be printed on the right sleeve of the Hougang jersey. There will also be buses ferrying fans from Woodlands Stadium to Hougang Stadium and back for every Hougang home match. Ng, who has been Hougang chairman since 2009, then vowed to improve not just his club, but also the standard of local football as he announced that the Cheetahs have received approval to run an Under-18 Centre of Excellence this season. Johor Darul Ta'zim and Bengalaru are changing the way clubs think and operate in Malaysia and India with deep pockets and modern ideas. Jacksen F Tiago got his coaching career in Malaysia off to a good start with a narrow win over Kuantan thanks to an own goal. KL weren't so fortunate as they celebrated their return to the second tier with a loss at home to Sabah. It also marked KL's first game at Merdeka Stadium. I like football. Once I discovered beer was preferable to doing all them funny exercises I realised I was never going to make the grade at any level so I devoted myself to watching as many games as I could. 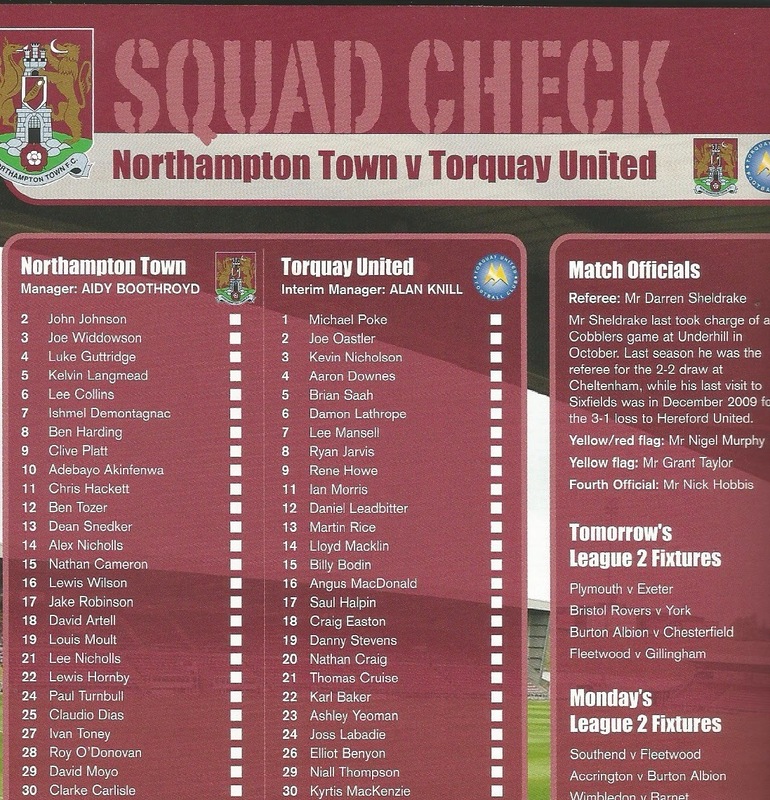 Which partly explains why I went to see Northampton Town v Torquay United back in 2013. It was freezing, there was still snow on the edge of the pitch; I hadn't seen snow in England for perhaps 16 years. I hadn't been to a Northampton game since 1987 and here I was complete with jet lag and hangover. What is interesting about that particular game, apart from it being my first visit to Northampton's Sixfield Stadium, is the Cobblers' line up that day included a couple of names who have since made quite a name for themselves in this part of the world. Get your magnifying glass out...you will see the name of Roy O'Donavan. The Irish striker, pictured wearing an old school Arsenal away shirt, scored the winner that cold evening, and it was a long cold evening, he waited until the 85th minute before providing some warmth for the 5,000 + faithful but has since left England and last season starred at DPMM in the SLeague. Then we have John Johnson, the one pictured with a bandage on his head.. He learnt his stuff at Middlesbrough, a club well known for youth development but is now plying his trade in India with Bengalaru. The other day he was playing against Johor Darul Ta'zim in the Asian Champions League Preliminary Round and he put in a typically English display; all heart and yes, he shed claret for the cause. Foreigners come, foreigners go. Not all have a positive impact on football but who would have thought two lads from Northampton Town would be leading the way in countries as diverse as Brunei and India. By the way, also playing in that Northampton Town game was Clarke Carlisle, latterly in the news for other reasons. Never met him but get well pal, do know others it has happened to. Persib returned to the scene of their greatest triumph in recent years, Jakabaring Stadium where they won the Indonesia Super League last season, but this time luck deserted them as it was Arema who lifted the much delayed IIC. It was Arema's new signings who proved key to the success, Beltrame scoring from the spot on 51 minutes only for Vujovic to equalise 15 minutes later to force the game into extra time. It was left to former Persiwa striker Kennedy to score the winner in the second period of extra time just minutes after coming on as a substitute. The IIC was the second trophy for Arema during the pre season following their success in the SCM Cup. They also shared Trofeo Persija with Persija and Sriwijaya.